Silver Maple Farm's straight Egyptian foundation mare, Glorietasayonaara was born April 18, 1983 and she was purchased by Henry and me in 1990. 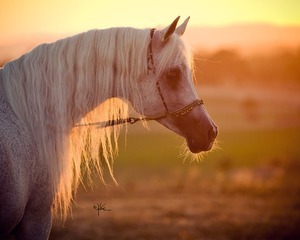 She is sired by Ansata Abu Nazeer (*Ansata Ibn Halima x *Ansata Bint Zaafarana) and out of the mare Glorieta Shahlima (Ansata Shah Zaman x Ansata Sabiha). Glorietasayonaara was the second purebred Arabian mare purchased by Henry and me but she was the first straight Egyptian. We purchased her from Judy Jones of Atallah Arabian Farm and she was very reluctant to part with this mare. It took me over a year to talk Judy into selling her. Sayo became our conerstone for the straight Egyptian breeding program at SMF. Judy has often said I came into her barn and literally chose the best of her mares to begin our program. The horses in Sayo's pedigree represent some of the most famous and illustrious individuals of the breed. The appeal of this line is very much their classic type, clean throat-latches, high tail carriage and beautiful movement. They all have very black skin that is fine, good feet and clean bone with large dark eyes. 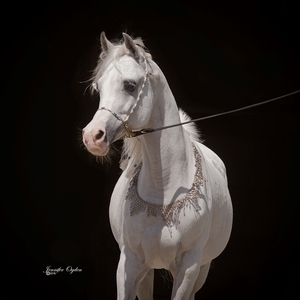 On a personal note, I would like to share that when I first saw Sayonaara, I had no true understanding of Egyptian Arabian horses, yet there was an ethereal quality to her carriage that spoke to my heart. I remember being struck by her beauty and fire, but at the same time I recognized her gentle and playful nature. 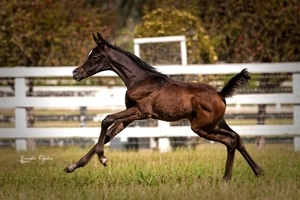 Sayo (Sigh-oh) was truly a character and she passed her wonderful carriage and personality on to all her foals. When we purchased Sayo in 1990, she was in foal to Ruminaja Ali. The resulting grey, straight Egyptian filly, Sahbine, was born in February of that year and remained with us all of her life. Sahbine followed her dam's example and produced some very outstanding individuals for Silver Maple Farm including her lovely daughter, Shaboura, by PVA Kariim. Shaboura represented the third generation for the mare family at SMF. In 2004 Sahbine gave us a wonderful filly via embryo transfer. This filly, Sahbrina SMF is sired by international champion *Simeon Shai+ and is now a mature mare. We are blessed to see this famliy continue forward through her daughters and granddaughters as well as her son, Ali Saroukh and grandsons, Sidon SMF and Symbolic SMF. In her younger days, when Sayonaara entered her pasture she would stop to scan the other paddocks in a regal manner. She then walked to the center and with her head held high, she slowly turned her graceful neck to look over her kingdom. After that move, she began trotting up and down each side of the pasture and calling out to all, her tail flagged and flowing, her nostrils flared. It never ceased to amaze me when all of a sudden the rest of the mares and foals in the adjoining paddocks joined in her game! Sayo only stopped when she saw the other mares imitating her. Once more she scanned the paddocks and, when she felt that all was right with her world, only then did she begin to graze. SAYO-ref from Christie Metz on Vimeo.